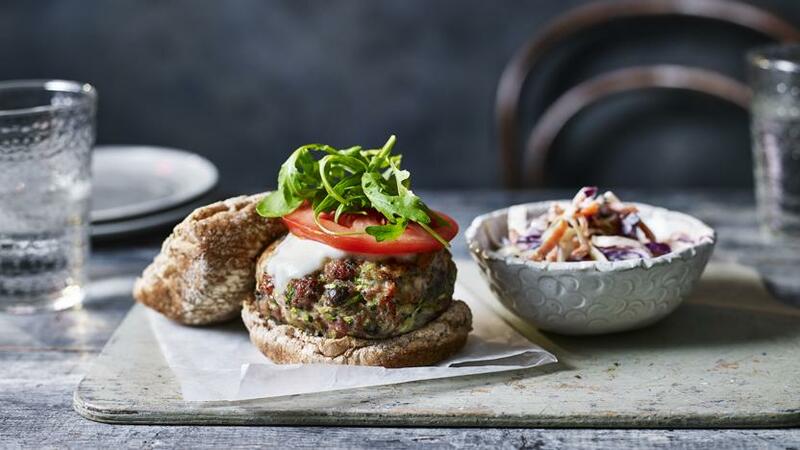 Adding grated courgette produces a lovely juiciness to these turkey burgers, topped with a melting slice of mozzarella and served with a fresh coleslaw. Each serving provides 605 kcal, 70g protein, 54.5g carbohydrates (of which 12g sugars), 12g fat (of which 4g saturates), 11g fibre and 4.4g salt. Put the turkey mince into a large bowl. Take the grated courgette in handfuls and squeeze well to remove excess water, before adding to the bowl. Toss in the dried herbs, bicarbonate of soda, chilli flakes and capers, season with salt and pepper and mix well. Divide the mixture into four equal portions and shape into burgers. Place on a baking tray lined with baking parchment, cover and refrigerate while you make the slaw. Put all the cabbage into a bowl, sprinkle with the salt and mix well. Leave to stand for 20 minutes, then rinse thoroughly and drain well. Mix in the other coleslaw ingredients. Preheat the oven to 240C/220C Fan/Gas 7 Fan. Remove the burgers from the fridge and spray each one with a couple of sprays of oil. Cook on the top shelf of the oven for about 12 minutes, or until golden-brown and cooked through. Lay a slice of mozzarella on each burger and cook for a further 4–5 minutes, or until the cheese has melted. Place a turkey burger inside each bun, if serving. Top with a slice of tomato and a handful of rocket leaves, then close the bun lids. Serve with the coleslaw on the side.